Happy Kitchen Sink Stamps Monday! Hope you all had a wonderful weekend. Hey, did you know that Kitchen Sink Stamps is now on Facebook? How cool is that! I used the Spellbinders Rectangle Die to cut/emboss my White Stamped panel, then used Spellbinders Labels 4 and debossed around my image. I sponged the edges with Soft Suede Ink thank layered on Chocolate Chip and Garden Green panels. I debossed my Mustard panel using Spellbinders Impressabilities Flowers, then added used the CuttleBug Highlights Technique adding Chocolate Chip ink to my panel. I added a piece of Sable Swiss Satin Ribbon under my focal image. 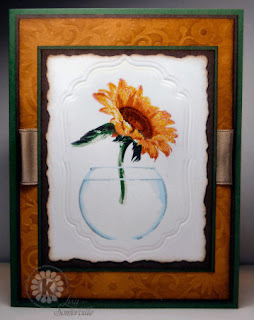 For more Kitchen Sink Stamps inspiration, check out the other Kitchen Sink Stamps DT members blogs: Angela, Dee, Connie, Julie, Lori, Lynn , Makiko, Maria (KSS Owner). Lisa, this card is so beautiful. You do absolute wonders with those stamps. What a gorgeous card, Lisa!! I love the mixing of these two images framed so perfectly with your Nestabilities! Beautiful, beautiful work!! Just beautiful, I am loving how the flower sits in the vase. The card design is just perfect! I am loving these stamps - they are gorgeous!!! I may have to invest in some of them. Thanks for sharing them with us, Lisa! Lovely card!! I love that little bowl - had pulled it out last week and never got around to using it! :) Beautiful sunflower!! So fun, Lisa!! Love how you paired this bowl with this beautiful flower!! Wonderful! beautiful Lisa! I love how you combined these sets. The sunflower looks fabulous in there!! Beautiful, Lisa! Love the embossed frame around the image--so elegant! oh my GOSH! Lisa, this is breathtaking! What you do with KSS is AWE INSPIRING! Incredible! It's amazing how fantastic something so simple can be. You have an enviable imagination!